Softberry works in close contact with its clients and collaborators to meet all their computational genomics needs. Our team of researchers and software developers is able to solve most complex problems related to our area of expertise. The follwoing is the list of some services we perform for pharmaceutical and biotech companies. d) Identification of gene models that involve alternative splicing. See examples in Sequence annotation explorer. 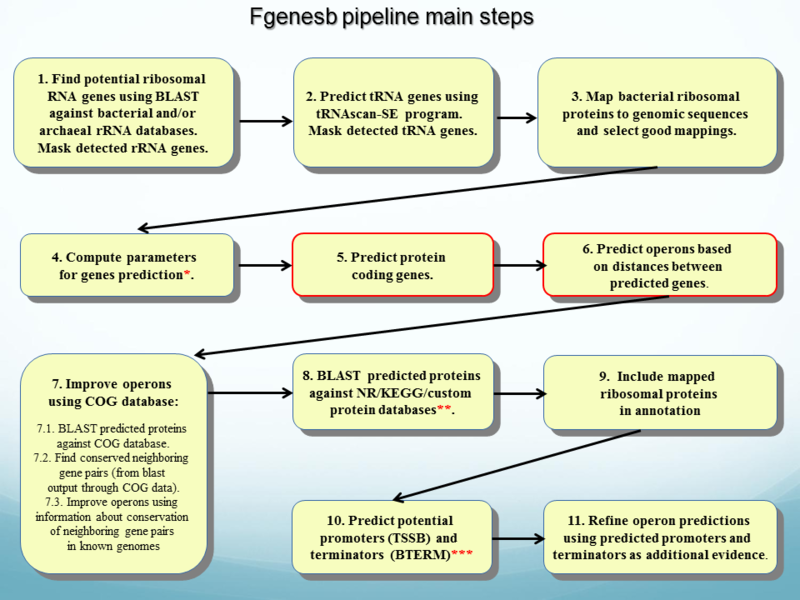 Bacterial genome annotation pipeline Fgenesb ( see flowchart) predicts genes (including RNA genes), operons, promoters and terminators. It provides functional and pathway annotation of predicted proteins with the user selected databases such as NR, COGS, EggNOG, KEGG and etc. Fgenesh: the fastest ab initio HMM-based eukaryotic gene prediction program with parameters for 539 genomes. 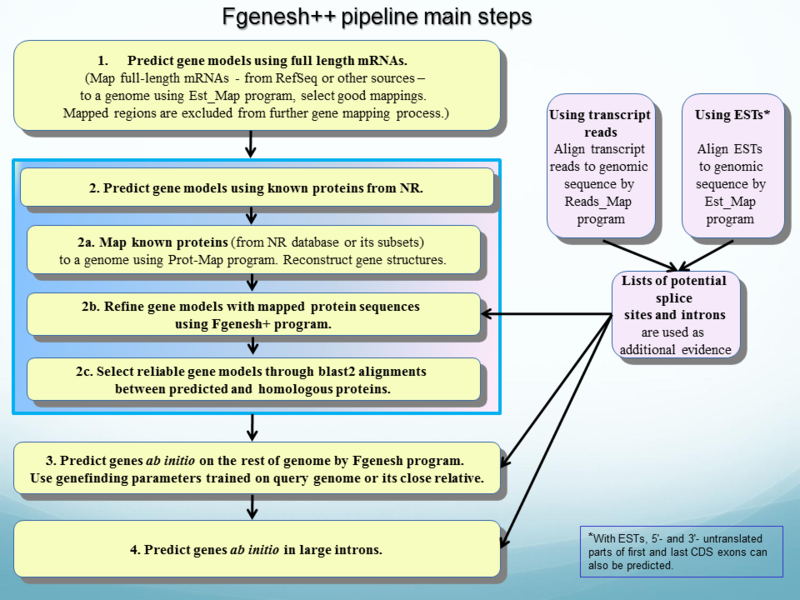 Other programs of FGENESH suite include FGENESH-2, FGENESH+ and FGENESH_C, which perform genefinding with support of related genomic, or protein or cDNA sequence, respectively, programs for Best ORF and splice sites, non-standard splice sites identification. 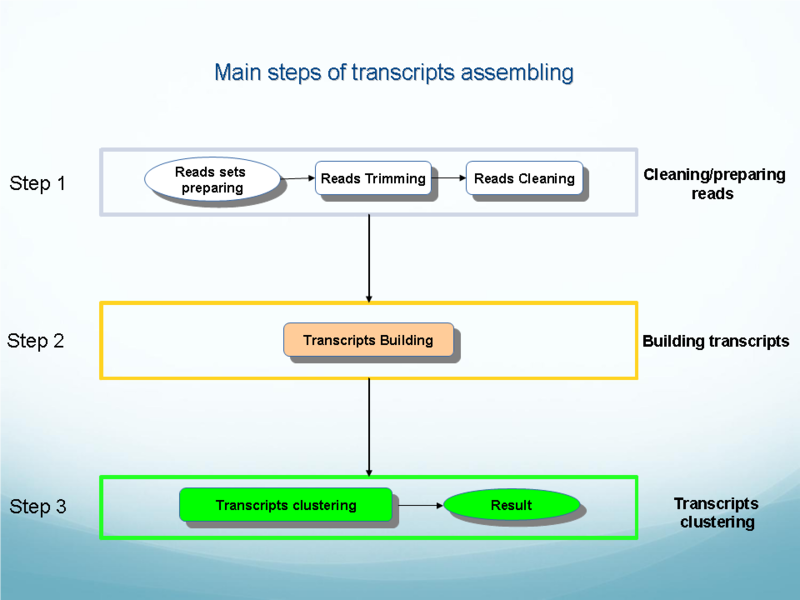 OligozipDNA ( see flowchart): Program for sequence assembly that includes error correction, contig and scaffold building. 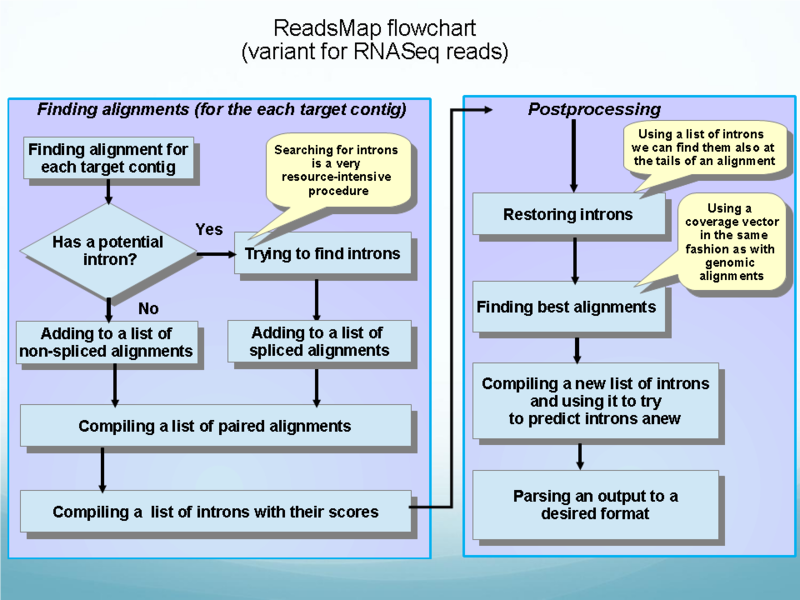 Genomic (no introns) variant ( see flowchart). 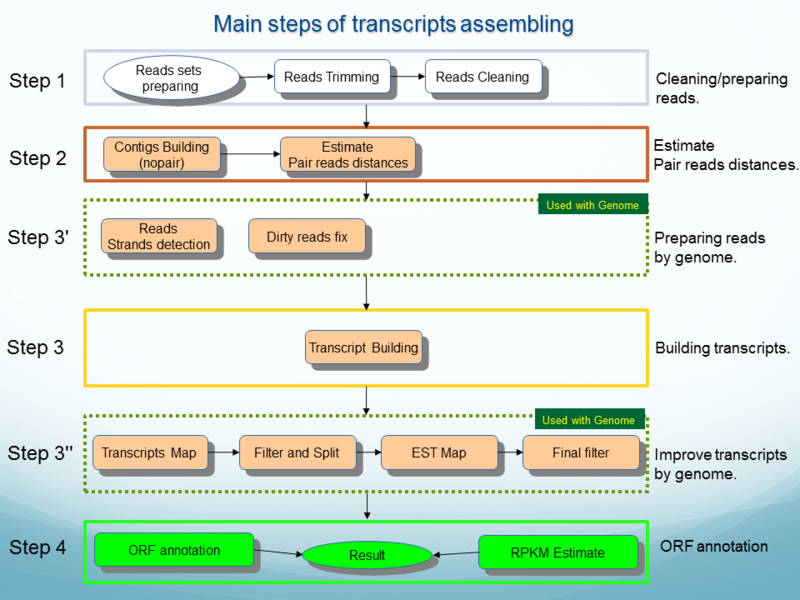 OligoZipRNA ( see flowchart): Program for assembling RNASeq reads to RNA transcripts, selection of alternative transcript groups and identification of RNA and protein coding subsets. 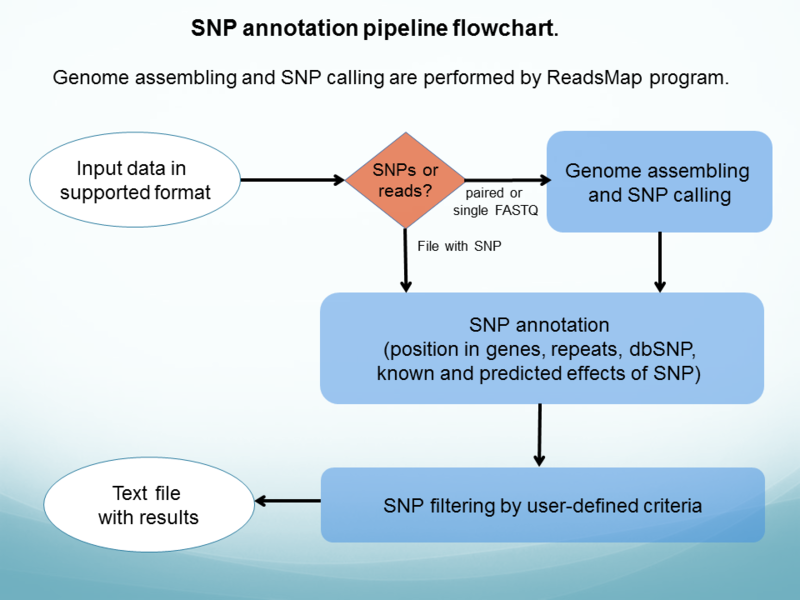 SNP discovery and annotation pipeline ( see flowchart). Constructing and Visualizing synteny for assembled genomes. TSSW/ TSSP/ TSSB: Programs for predicting animal, plant and bacterial promoters and functional sites. RegSite: Database of gene regulatory elements. Nsite/ NsiteM/ NsiteH: programs for analysis of regulatory regions and composition of their functional motifs. .
PATTERN, ScanWM-PL : search for patterns. PROT_MAP: mapping of a set of proteins on genome. 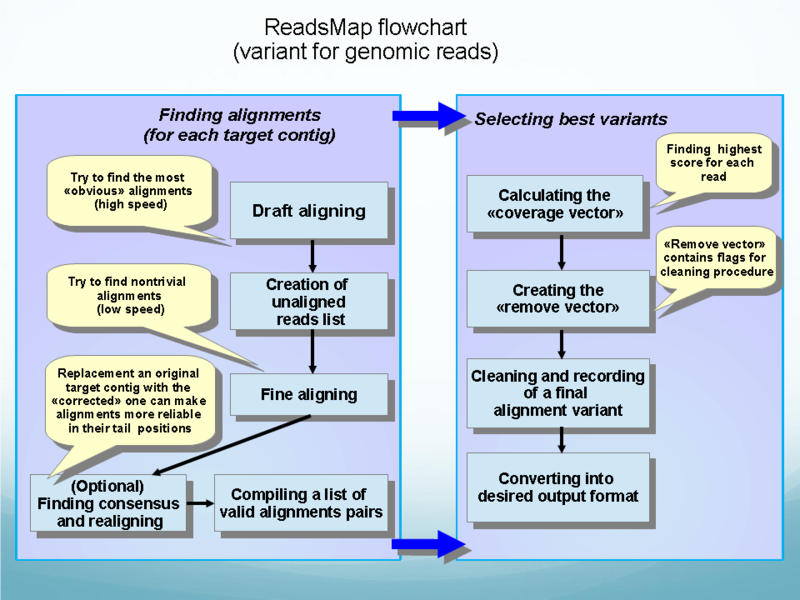 SMAP: mapping oligonucleotides to genome. DBSCAN :database homology search program similar to BLAST, but handling multimegabyte-size sequences. ProtComp: Program for predicting protein sub-cellular location, works on all taxons, including animals, plants, fungi and bacteria. CYS_REC, PSSFinder, SSP NNSSP SSPRED SSENVID SSPAL: programs of secondary structure prediction. HMod3DMM: energy minimization program by molecular mechanic. 3DmodelFit: program for comparison protein 3D model and its original structure. MDynSB: Optimization of a protein structure via MD simulation in an implicit water solvent, optimization and folding of a protein via (the user defined) simulated annealing protocol in an implicit water solvent, optimization of a predefined protein loops while non-loop parts of the protein molecule is kept fixed in the course of the loop optimization. 3D-Match, 3D-MatchDB and etc: Programs for protein structure comparison, prediction and analysis. FoldRNA, FindTerm: RNA structure computing. See examples in RNA-viewer. MolQuest: Comprehensive, easy to use desktop application for sequence analysis. Includes ~ 100 program modules, dozen viewers and GUI running on Window, Linux and Mac OS platforms. See www.molquest.com for details. We develop for our clients custom-made data sets for gene- or functional site-prediction programs. These data sets can include known genes of given organisms, genes of related organisms, subsets of genes with particular expression patterns and other considerations. Our GeneExplorer program reads and analyzes expression data represented by relative intensities of signals for different types of gene expression experiments. It can analyze all or marked groups of genes or tissues, select tissue-specific genes based on complex criteria, provide visual represenation of expression data, identify genes correlatively expressed in a given set of tissues, select disease-specific genes with particular characteristics, such as receptors or secreted proteins. See also SelTag - a tool for analysis of expression data and Proteomics - MS data processing. We customize our software to meet needs of our clients: support of different computer platforms, modification of data formats for easy integration into customers' databases, development of databases with specific information compiled from public sources or computed from avaiable informaton. In addition, almost all our software is available with source codes, and therefore can be easily changed by customers themselves.